Last night saw a special preview of the forthcoming Christmas special A Christmas Carol take place at the British Film Institute. 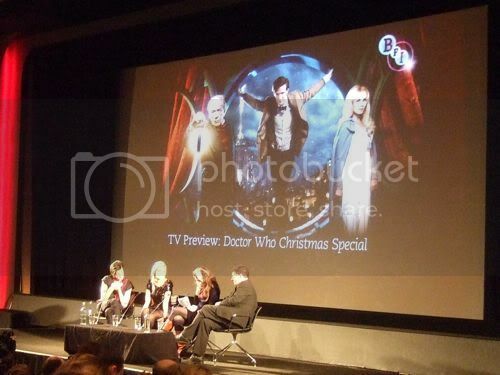 The episode was then followed by a Q&A session with Matt Smith (the 11th Doctor), Katherine Jenkins (Abigail Pettigrew), and lead writer/executive producer Steven Moffat; Karen Gillan (Amy) was also at the event, but remained in the audience. Well, the base line of Doctor Who is a man who lives in a telephone box and saves the universe in a bow tie. So you have to go some to up that. And if you’re going to do a Christmas Day episode, which is basically the principle that the audience have had a selection box for breakfast and are probably drunk, then you actually have to sort of move it on a bit. Because, actually, a normal episode of Doctor Who wouldn’t be enough at that point. I think you have to be emotional. I think you have to go on the whole journey, don’t you? You have to laugh and cry a bit. A Christmas Carol, oddly enough, the original, is sort of the whole package. It’s A Wonderful Life, which is kind of in a way a variant of A Christmas Carol, is the same. Yes, I think you should be…as I say, you’re full of sugar and alcohol, you’re going to be tripped off into any place at any time. I have to say all I was struck by was…it never seemed for a moment that you hadn’t acted before. You were completely well prepared. Because on the one hand, you’ve got Katherine being very diligent and accessing real emotion and really getting in there. Then me and Michael (Gambon) just sort of dossing down. And so I was utterly impressed and she was thoroughly prepared and I’m convinced that she’ll go on and do other parts. As one might expect, a number of plot points have been discussed and since reported in the media, but we will not be reproducing them due to their spoiler potential for the Christmas Day episode; however, you can read a comprehensive review of both the story and the Q&A from journalist Ian Wylie's blog, Life of Wylie. Other reviews may be found at Radio Times, The Guardian, Daily Mail, BBC News, SFX and Den of Geek.